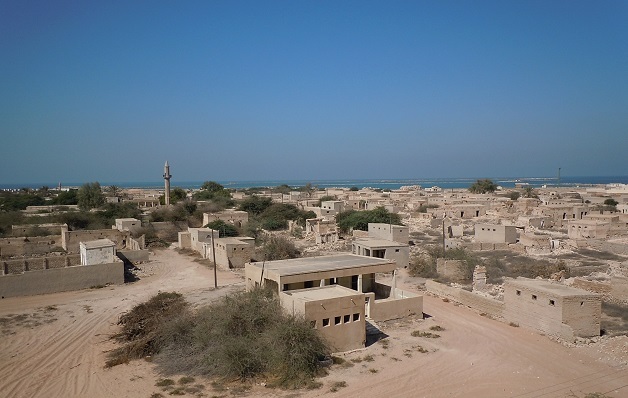 Jazirat al-Hamra or Red Island, now part of the mainland, was once a peninsula that, with high tide, became a small island just off the coast of Ras-al-Khaimah. The inhabitants made their living off the sea: trading, pearling, fishing. Once a thriving town, it fell on bad times in the early twentieth century, when the Japanese perfected the process of cultivating pearls, effectively bringing an end to a way of life that prevailed for centuries. Most of the Al Za’ab tribe, who lived here, left around the formation of the United Arab Emirates as a country in 1971, when they fell out with the ruler of the area, and accepted land from Sheikh Zayed in Abu Dhabi. By leaving their properties behind to succumb to neglect and the ravages of time, the previous inhabitants left a unique glimpse into the past. One that offers an abundance of photo opportunities. It is a ghostly reminder of what life looked like in the pre-oil days of the country, and provides a fascinating look, at the history of the town, through the use of different building materials over time. The walls of the old, typical coastal buildings, which made use of coral and coral rag (a rubbly limestone that is made up of ancient coral reef material), as well as the exposed mangrove poles and palm tree trunks that were used for internal support and ceilings, create especially interesting patterns and textures in their exposed state. My first visit to Jazirat al-Hamra was shortly after I arrived in the UAE in October 2011, when my husband and I lived in Ras-al-Khaimah. I was captivated by this place, and its stories of jinn, as in Arab folklore, jinn frequent abandoned places. Those beings created from smokeless fire, predate Islam, and have a whole Sura in the Qur’an (Sura 72) dedicated to them. Since our first visit, almost seven years ago, the Department of Antiquities and Museums in Ras-Al-Khaimah, has started a process, in which selected buildings are being renovated to preserve the heritage in a way that can be shared with visitors to the area. Despite the wire fence surrounding part of the village, and specific restoration sites that would be off-limits, one can still access it, and walk through the area. Here are other examples of the places, currently undergoing restoration work. As before, it was a joy to walk around aimlessly, allowing the village itself to speak to me, as most of its current charm, lies in its crumbling walls, and glimpses of colour that hints at a past not entirely forgotten. The best place to finish off a visit to Jazirat al-Hamra, especially on a scorching summer’s day, is Puro Café at the entrance to nearby Marjan Island. It is a welcoming place with friendly staff, good food, and a fantastic view over the Arabian Gulf. # Please note that, although the area is perfectly safe, many of the houses on the edge of Jazirat al-Hamra have been converted into workers’ accommodation, and visiting this abandoned area on your own, especially if you are a female, may not be the most sensible thing to do. Take someone with, and explore to your heart’s content. It is indeed. I love these old, crumbly places. If only those walls could talk. Can you imagine all the wonderful stories they would tell? Have ya’ll gotten settled in Portugal yet? Thank you, Julie. No, not yet. We are heading there again for a two week visit at the end of July to get more work done on both the land and the house. My husband’s current work contract here only expires at the end of December next year. We are itching to go, but we still need to earn money for all the infrastructure we want to build, which all cost a lot of money. I am not updating our blog/website on our progress that often, as it is so slow, but there should be another story or two soon. What a wonderful place! I enjoyed comparing the two sets of photos. Thank you, Clare. I always think it is interesting, when one can compare places over time. It is not often that I get to visit the same place, years later, so this was really interesting to me. I am very curious to see what the restored buildings will look like, but I think that will still take quite some time before they are done. Wow, looks like a ghost town, and seeing the comparison. Always love the photos. Thank you, Terri. I love ghost towns, as it never fails to wake up my imagination. I am with you. Love ghost towns and love to photograph them. It was a joy to revisit, especially as I don’t do it often. What a beautiful discovery in the desert and I love your comparison photos. It will be interesting to see what the place looks like once the restoration work is complete. Such things are always tricky and subjective as to their success. Tricky, indeed. There is often a temptation to over restore, and because the climate here is so harsh, finding just the right balance between using traditional materials, and making use of modern techniques and materials to recreate the past, can be especially challenging. And like you say, the results are always subjective. The pearl merchant’s house made me wonder if you had read “The Sand Fish” — or perhaps you were the one who first recommended it. Yes, I have read it, Ralie, even though I haven’t recommended it. It gives a lovely insight into a time, place and culture that no longer exists exactly like that. I love historical fiction for that exact reason. I always feel a whiff of melancholy blowing through all those empty buildings. It’s not just the missing human element; it’s also the shells of the buildings themselves, open to the wind and sands and beating sun. I do love the colors and textures, though, and the history here – including that of your two separated visits – adds some weight to all that emptiness. What an amazing experience you’ve had in your temporary country! Fascinating … and such wonderful images. Thank you for your beautiful, and kind words. There is indeed “so much to learn, so much to see, so much to experience ..” And often, all of this can be found on our doorstep. We just need to venture out, and allow ourselves to notice it. your photos are stunning. What an adventure! Thank you so much, Jamie. It seems we are both drawn to places that does not feature on main tourist trails. This place looks very interesting!